Researchers at Harper Adams University in Shropshire are trying to sow, look after and then harvest a field of barley using only robots and autonomous vehicles. No humans are allowed into the pilot-plot at all. We covered the project when it started and again here. They call it "Hands Free Hectare" and in the office we call it "Robocrop". Long story short the team are actually doing pretty well with a field of barley shoots that looks healthy if a bit patchy here and there. In fact, they're doing so well with their combination of off-the-shelf tech and nifty engineering skills that I began to wonder if building farming robots wasn't actually pretty easy? Then I spent an afternoon at the global agricultural-robot challenge also hosted by Harper Adams. I watched the best student engineering teams from all over the world put robots to work on simple agricultural tasks. And I saw that making an agricultural robot that performs is actually really, really, really difficult. Harper Adams Hosted the "Field Robot Event" over three days and fourteen teams from as far afield as Mexico and Slovenia took part. I was lucky enough to watch the teams take part in one of the toughest challenges inside the "soil hall". This is a large building with an earth floor which had been planted up with hundreds of maize plants. 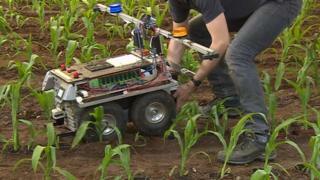 The idea was for the robots to safely navigate between the rows of maize and spot "weeds" in the form of pink golf balls while avoiding "obstacles" in the form of bright yellow tennis balls. Having mapped the weeds the robots then had to spray them with water standing in for weed killer. I watched robots refuse to move at all, others simply careered across the field smashing maize plants to pieces. One happily trundled along before screeching to a stop and emitting a noise that would put a particularly irritating car alarm to shame. I did ask the organisers if this particular challenge wasn't just too hard? Only to be told that was the point. To push the students and their machines so that they achieved more and more. The long term aim here isn't for these (sometimes slightly Heath Robinson looking) machines to be developed into the robots of the future. Instead the idea is to develop the students themselves. Because drones, artificial intelligence and programming will soon be just as useful on a farm as welding and basic engine maintenance. It should be said some of the robots I watched did manage to cope with the fiendish tasks they'd been set. And when the odd one suddenly decided to make a break for it the team responsible would accept it all with good humour and set to work sorting out what they needed to change. Meanwhile I learned that the achievements of the "Hands Free Hectare" team really are pretty extraordinary. Making agricultural robots is possible with current technology, but it's also really hard. I have a healthy new respect for the Hands Free Hectare team who currently make it look so easy.